Former Oklahoma GOP Chairman and National Republican Committee State Coordinator, Matt Pinnell announced today he will compete for the position of Lt. Governor. 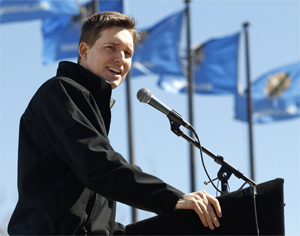 The youngest GOP state party chairman in the country at the time of his election, Pinnell helped the party secure all five congressional seats and every statewide elected office simultaneously for the first time in Oklahoma history. Pinnell pledges to fight for smaller government, less regulation, and a pro-growth business environment. He is a graduate of Oral Roberts University and lives in Tulsa with his wife Lisa and four children. Pinnell in his announcement release wrote, “For the last several months my family, friends, and fellow Oklahomans have encouraged me to continue a lifelong fight — making Oklahoma a place where our children and grandchildren can prosper and succeed for generations to come. “As I’ve traveled the country helping to elect Donald Trump and win Republican majorities in the U.S. House and Senate, Oklahoma has always remained home. I have met so many Oklahomans who share my vision for an innovative, prosperous, and forward-looking state. 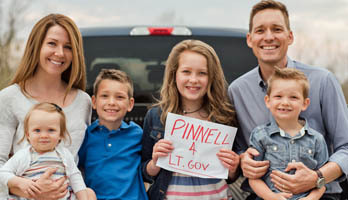 This is why I’ve kept my family in Oklahoma, why Lisa and I started our small business here, and what has led me to run for Lieutenant Governor today,” Pinnell wrote. For more, click here for Matt Pinnell’s web site and click here for his Facebook page. This entry was posted in State on April 20, 2017 by admin.